Hours: Daily, 6 a.m. to 7 p.m.
Sunday, April 17th, 4-6 p.m.
Sunday, March 27th, 4-6 p.m. Follow this project here on Instagram. Hear more about this project live on KBOO with Kristin Yount. Read more about this project in The Portland Mercury here. Watch Kevin Neidorf's mini-documentary about this project here. Read a review of this project by Rob Wilcox Jr. here. "Love Wins," in progress, by Wynde Dyer (2016). Tarp, batting, thread. Approx. 64" x 64"
Sharing the Scraps presents three new interrelated bodies of tarp quilt work that, when combined, present an implicit proposal for a new kind of sharing economy--as opposed to the so-called corporate "sharing economy" of Uber, Airbnb, and the ilk--wherein individuals with very little financial capital utilize their social and creative capital, and on-hand skills and resources, to engage in small-scale philanthropic efforts to help those adversely impacted by income inequality. The first body of work, "2015 Was a Really Hard Year (2015WARHYs)," is a playful--but not at all un-painful--meditation on the political challenges and changes of the last year (ex. the housing crisis, issues of transportation equity, un-affordable "affordable" health-care, urban density, the legalization of medical marijuana, marriage equality, etc.) and ways in which these issues impacted me personally (ex. anger, sadness, and their debilitating psychosomatic effects on my physical health) and professionally (ex. "Maybe I have to throw the towel in on my now non-profiting social-justice cab company, because, well, ironically, doing art pays better?"). 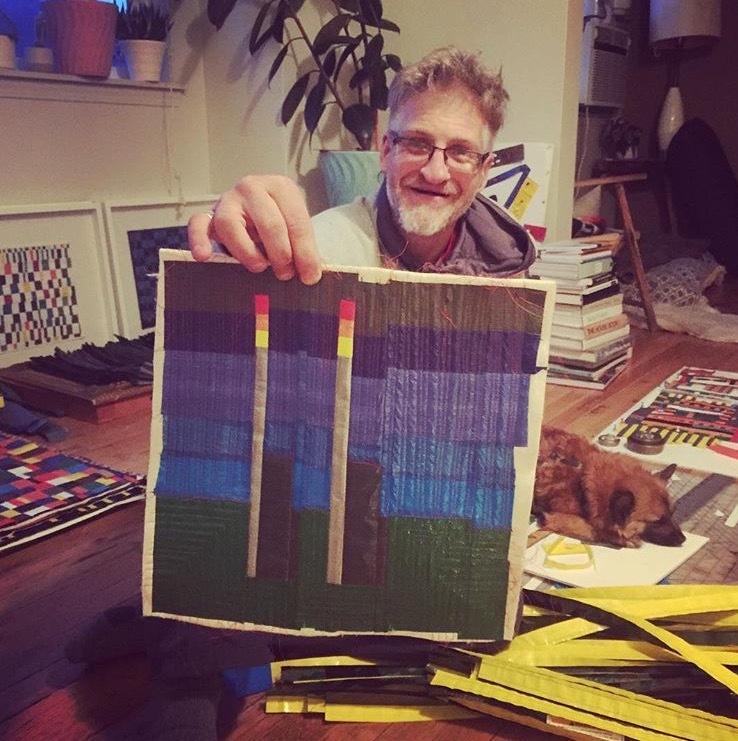 The second body of work, "Quilts for Cost-Burdened Renters (QFCBRs)," consists of a large series of tiny studies for larger pieces and/or improvisational quilts made of the scraps left over from larger works. Framed in 20" x 20" shadowboxes, QFCBRs are my response to the discomfort I feel in having the privilege of living in a federally-subsidized income-restricted--though hardly "affordable" as my rent is certainly more than 30% of my monthly income!--apartment complex while friends and strangers everywhere are receiving exorbitant rent increases and no-cause evictions. 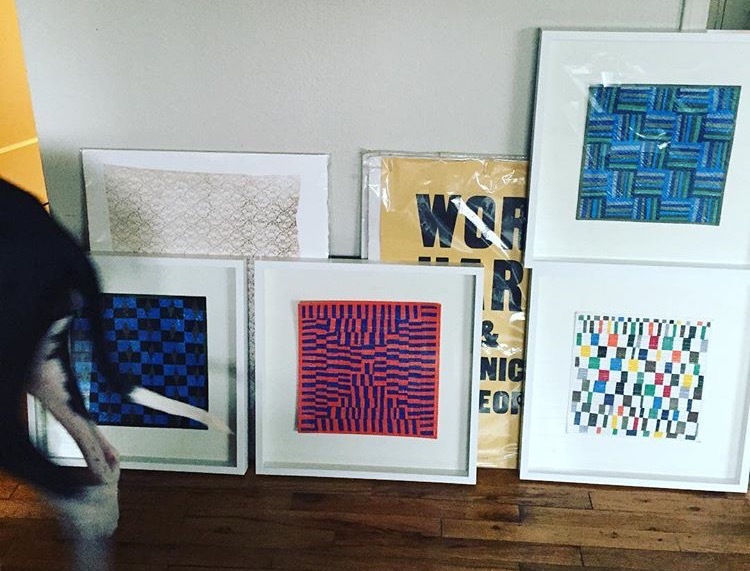 Each piece is priced at the exact amount of one individual's rent increase, and the full proceeds--minus a $30 fee for materials and framing--will be donated to cost-burdened renters as one-time no-questions-asked micro grants. 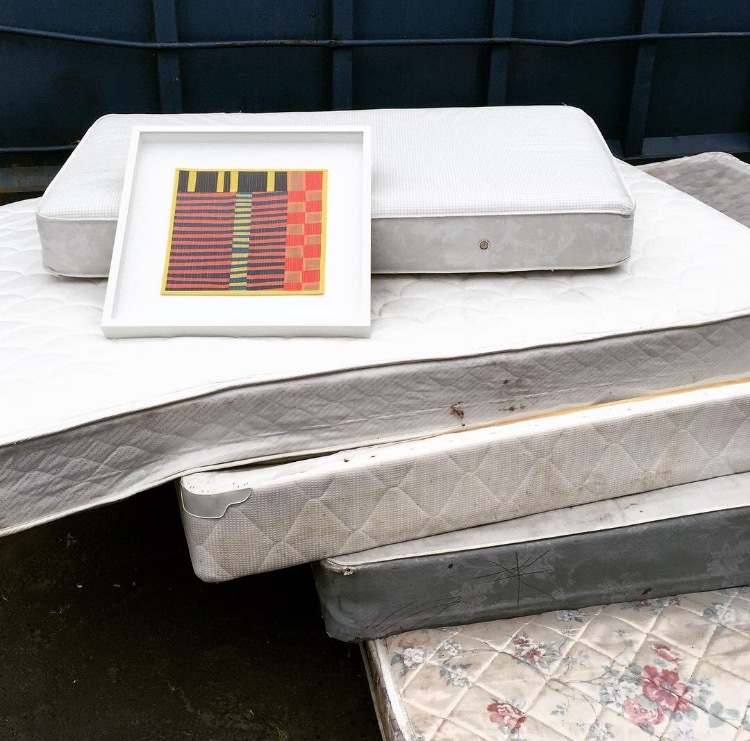 The third body of work, "Hazelnut Grove Quilts (HGQs)," features designs by homeless residents of Portland's controversial city-sanctioned tent camp along N. Greeley. I host the residents of Hazelnut Grove (HG) each Sunday for Bath + Art Time sessions at my apartment. As a formerly homeless individual myself, I try not to forget my roots, or the kindness bestowed upon me by friends and strangers during my nine months of car camping in 2012. In the tradition of giving back, residents of HG receive the full proceeds from any sales of their tarp quilts. This helps them diversify their normal revenue streams of SSI/SSD, panhandling, and can collecting. Viewed together, the works in Sharing the Scraps are my way of transforming the intense negative emotions I feel in response towards growing issues of inequity in our city and country into something more positive, more tangible, more accessible, and more actionable. This is my way of tentatively saying, "What if, just what if, what if maybe we all came together around the idea of sharing our scraps in ways that are doable, immediate, direct, and sustainable? What if maybe, just maybe, we could help those less-advantaged in small ways that makes traversing these changing times just a little bit less alone and just a little bit easier for all of us?" Central to this project is a Native American story I've held close to my heart for years. In times of recent I've needed to remind myself of it regularly, often just to make it through another days. The story goes something like this: A wise old man who says to his grandson, "Son, there are two wolves fighting inside of me. One is the wolf of hate and fear, the other is the wolf of love and hope." The little boy asks, "Which wolf wins?" The wise man answers, "The one I feed." Sharing the Scraps is about feeding the love and hope wolf, and starving out the fear and hate wolf, because there are only enough scraps for one victor in this fight. 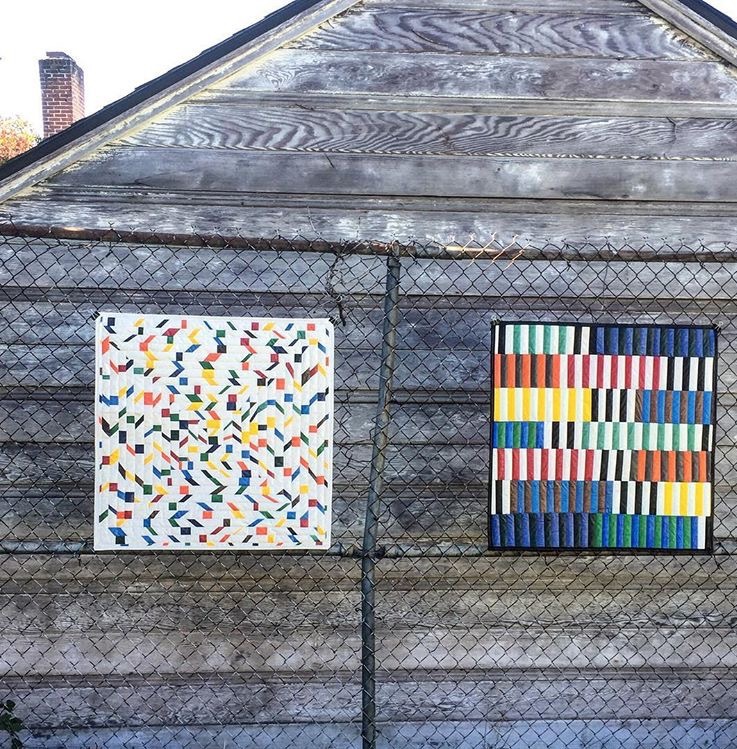 "Quilts for Cost-Burdened Renters," by Wynde Dyer (2015-2016). Tarp, batting, thread. Approx. 13" x 13" in 20" x 20" shadowbox frames. 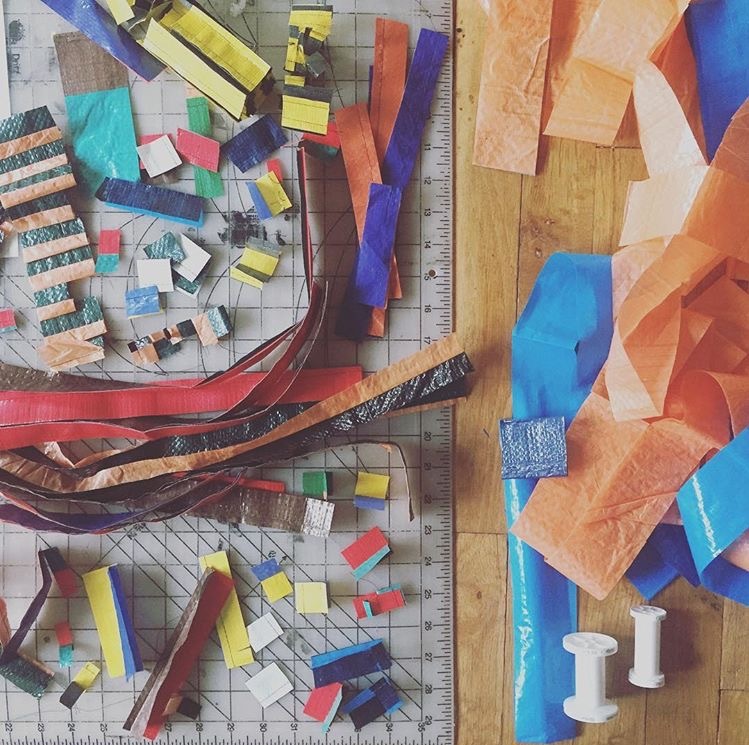 "Maze of Minimum Wage," in progress, by Wynde Dyer (2015). Tarp, batting, thread. Approx. 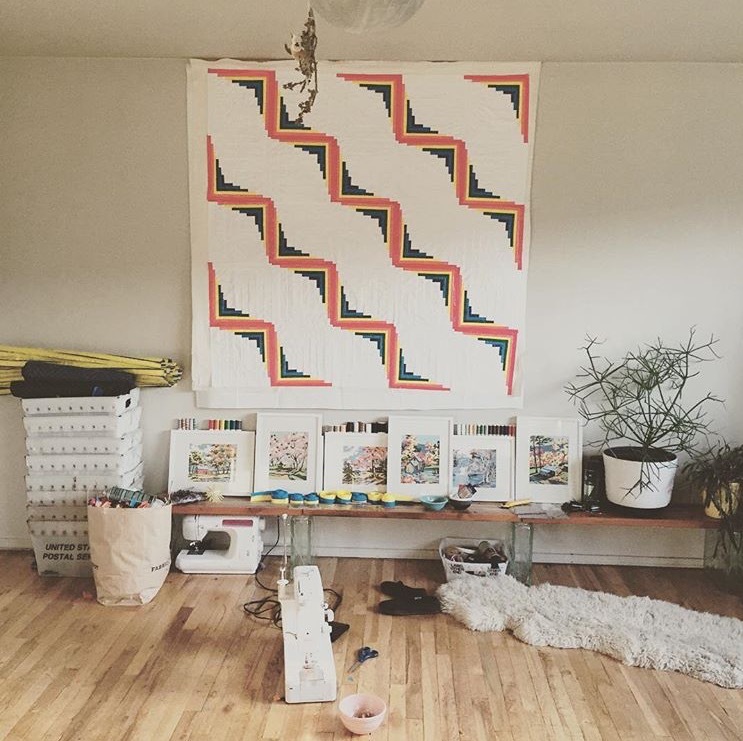 34" x 34"
"Quilt for Cost-Burdened Renters," by Wynde Dyer (2016). Tarp, batting, thread. Approx. 13" x 13" in a 20" x 20" frame. 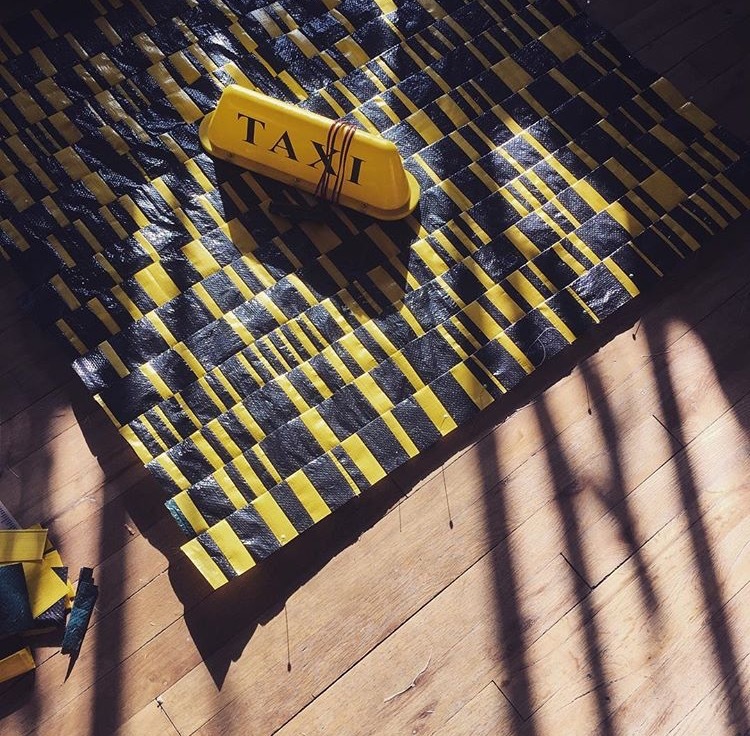 "Death to Taxi?" 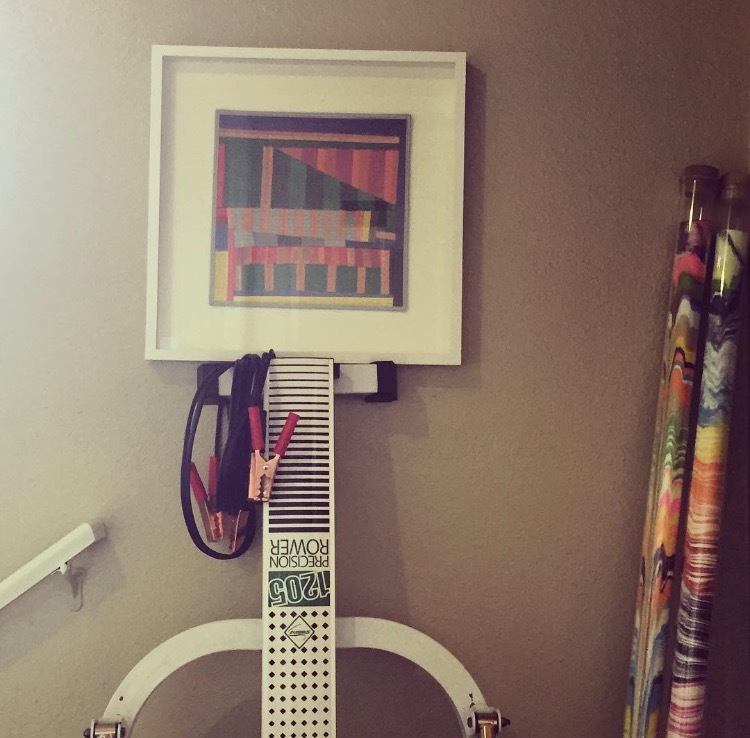 in progress, by Wynde Dyer (2015). Tarp, batting, thread. Approx. 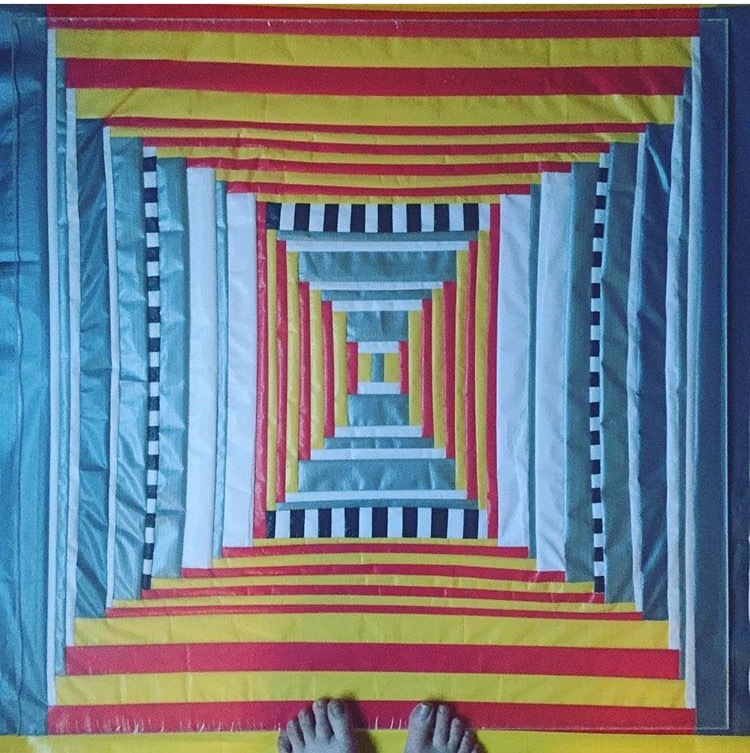 34" x 34"
Hazelnut Grove resident Jaison with the smokestacks quilt he designed during Sunday Bath + Art Time. "Quilt for Cost-Burdened Renter no. 5," by Wynde Dyer (2016). Tarp, batting, thread. Approx. 13" x 13" in a 20" x 20" frame. Sewing circle helpers Diana Jackson and Ruthanne Berry-Richards. "A Cautionary Tale of Recreational Marijuana," in progress, by Wynde Dyer (2016). Tarp, batting, thread. Approx. 34" x 34"
"Quilt for Cost-Burdened Renters no. 6," by Wynde Dyer (2016). Tarp, batting, thread. Approx. 13" x 13" in a 20" x 20" frame. 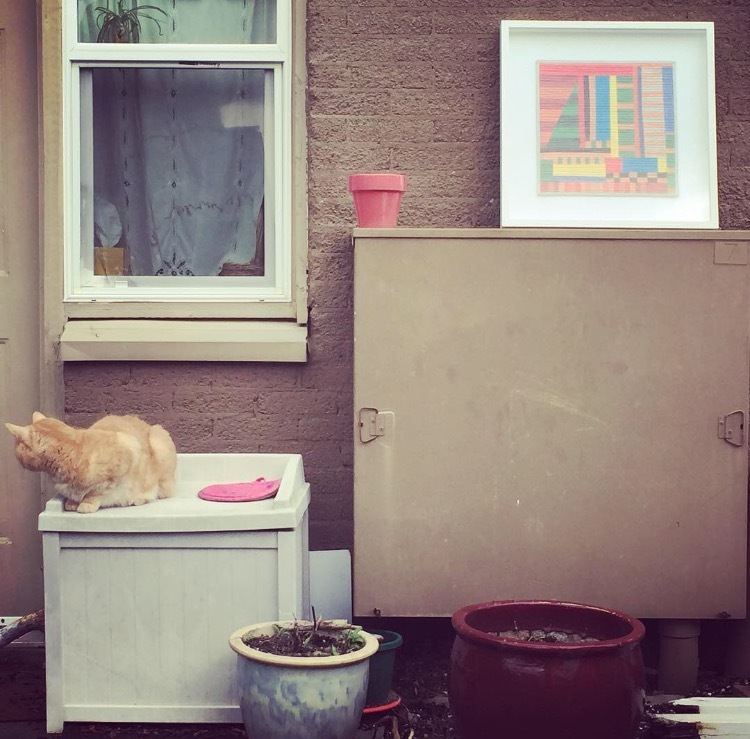 "Kittens and Ice Cream," and, "Ban the Box," by Wynde Dyer (2015). Tarp, batting, thread. Both approx. 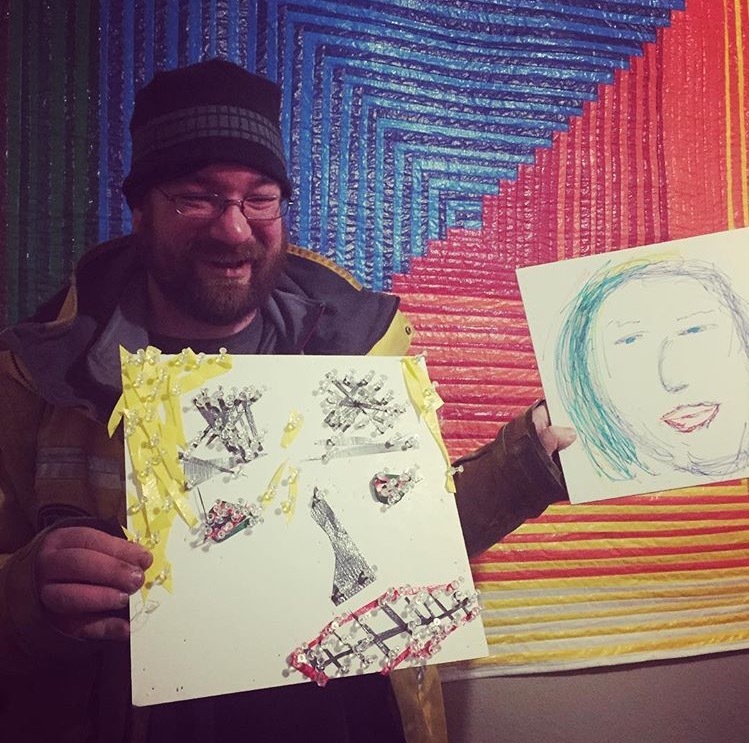 34" x 34"
Hazelnut Grove resident Mike with the in-progress tarp scrap quilt he designed and the drawing that inspired it. Interested in volunteering to help the homeless residents of Hazelnut Grove? Please join the Support Hazelnut Grove FB page. Are you a member of the press interested in interviewing me or the participants in this project? Email me. Purchase inquiries? Email Wendy Swartz at Stumptown. We will post a catalog of available works soon. Want to stay up to date on this project? Follow me on Instagram. Want to keep up with my life goings-on? Follow me on Facebook.